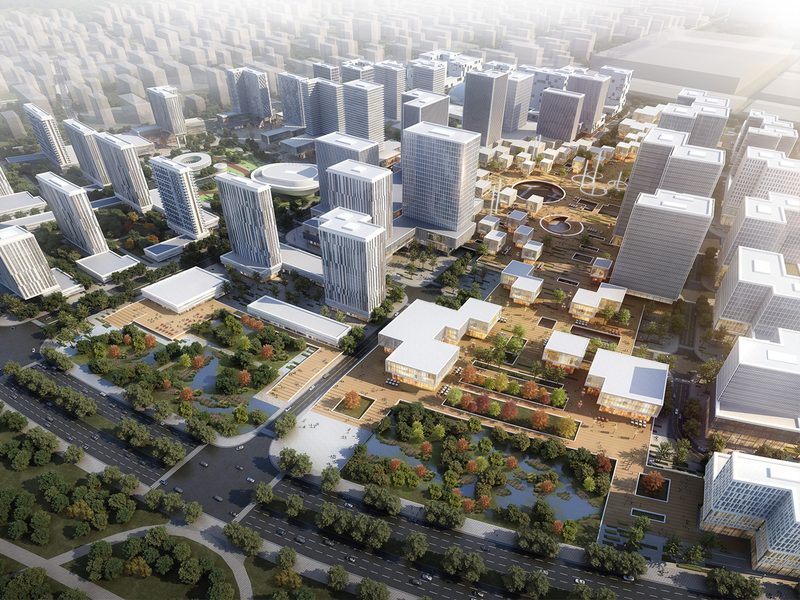 The new International Communication District is located in the core area of ​​Wuguang High Speed Rail City, a land-intensive development aiming to conserve natural resources, highlight regional functions, improve economic influence and promote future growth. 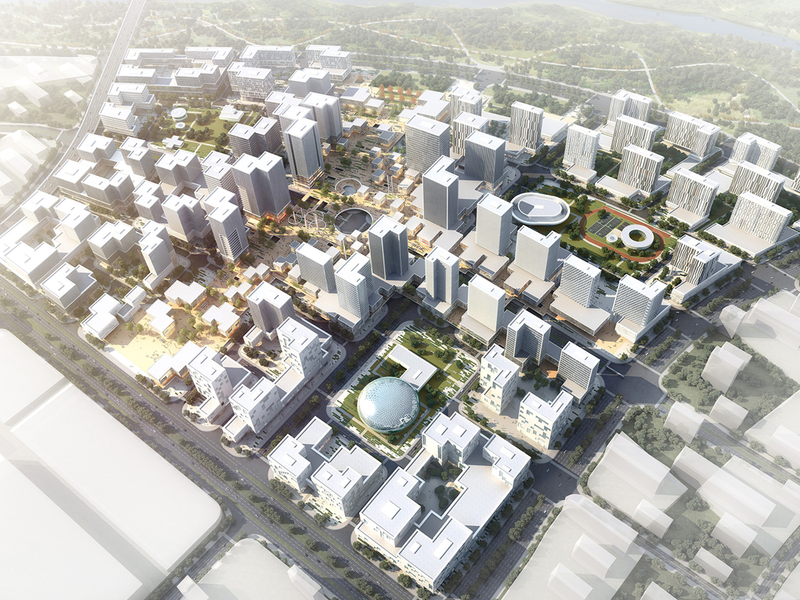 It aims to create livable urban centres that promote quality of life, incorporating the most advanced types of commerce , science and technology, and ecology in a single modern city district. 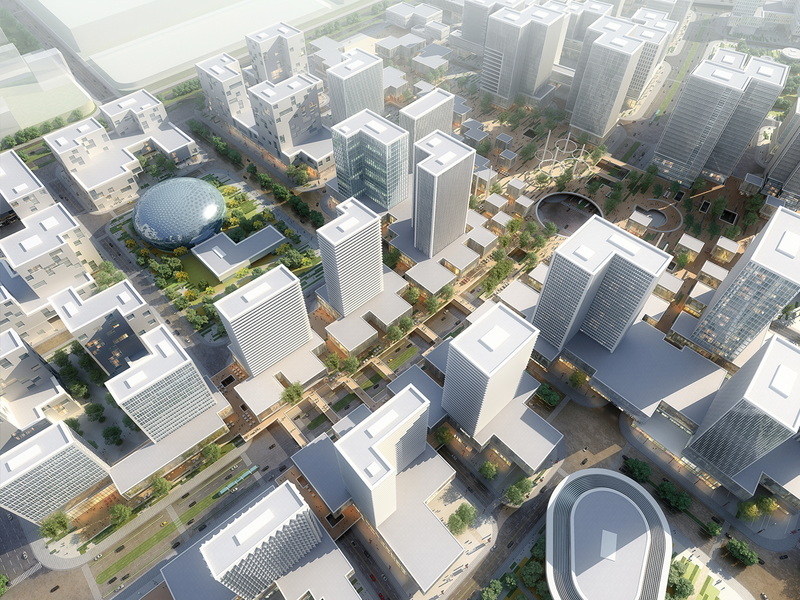 The key themes of the project are ‘Green, Smart and Exchange City’, using the underlying principles of urban ecologies, Smart Cities and socio-economic synergy to drive the design. Cities should not only provide accommodation for its inhabitants in the form of clusters of buildings of high density and efficiency, but also provide the means for people to meet and interact, either as part of their daily live-work processes or as part of the un-planned encounters or extra-curricular activities that make city life enriching and fullfilling. We have found that the provision and management of ‘public space’ are a key factor in the perception of the quality of urban design, and therefor the perception of the level of ambition and commitment of the institutions in charge. According to Copenhagen’s City Architect, Tina Saaby, urban planners should “Consider urban life before urban space; consider urban space before buildings”. 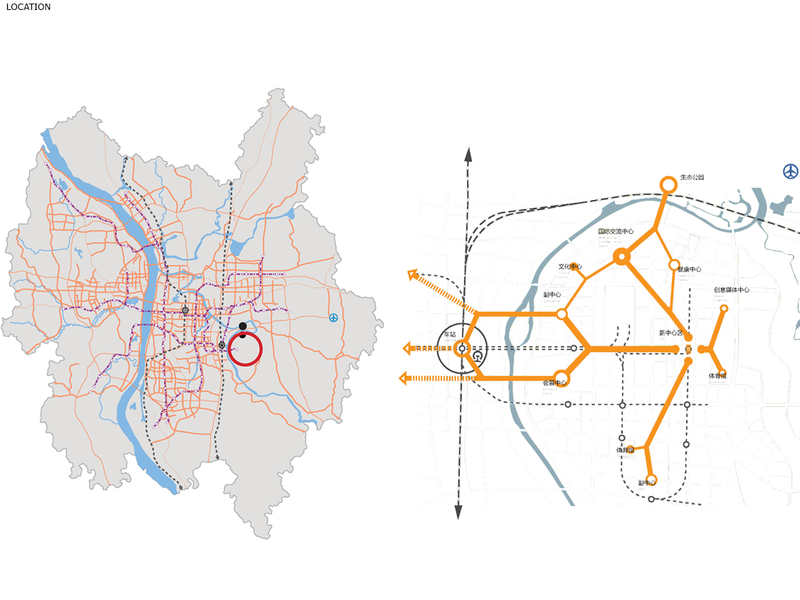 The climate of Changsha allows us to consider a range of outdoor urban spaces that will form the connective networks to experience and engage with the city. Dense urban areas can be catalysts and incubators for new types of activities and interactions, improving and evolving the socio-economical effectiveness and cultural richness of city life. The successful planning of dense urban areas relies on awareness of the different and often contradictory interests in the use of public space. Successful and iconic urban spaces play an important role within the cultural and socio-economic fabric of the city as a whole, creating recognisable locations and allowing people to gain memorable experiences. 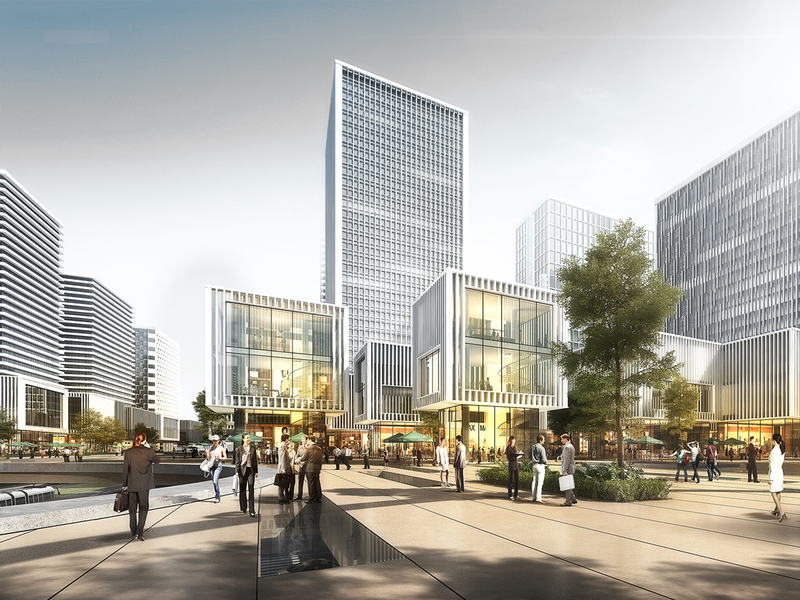 Our goal for the Changsha International Communication District is to create strategic high quality urban environments that merge circulation and programs, economic and cultural interests, planned and spontaneous events, in order to create a durable architectural identity and the capacity to adapt and evolve over time. The ‘urban fabric’ of the masterplan proposal will incorporate a strategy of ‘soft zoning’ – top down allocation of different neighborhoods within the overall site, while also creating opportunities for the interaction and mixing of different user groups. The massing strategy for the urban plots is calibrated to incorporate more public spaces towards the ‘mixing zone’, stimulating the interaction of different user groups and sharing of services. Different scales and characters of ownership boundaries promote flexibility in the more private areas of the site. The proposal promotes a strategy of ‘High-Resolution Urbanism’ to allow the urban planning framework to address the inner workings of the proposed urban ecologies at a local level, using a detailed scheme to incorporate the functioning of networks, distribution and local exchange. 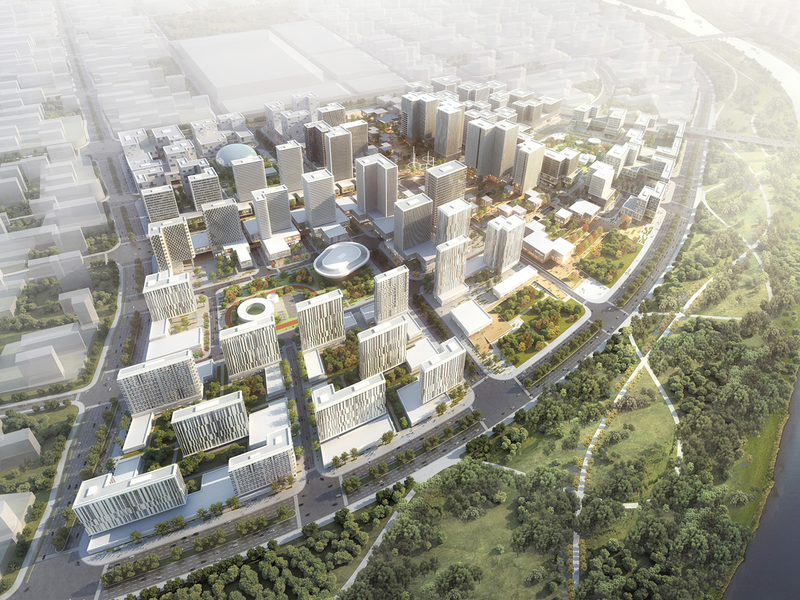 Based on our previous research, the design process for the Changhsa International Communication District is developed with a clear logic and consistent step-by-step translation of design information over time. This allowed for the design process to ‘generate’ traceable solutions which can be evaluated against the performance criteria that informed the design process in the first place. The use of rulesets allowed us to generate site-specific outcomes within the limitations of a particular context, allowing the project to take full advantage of and contribute to environmental, programmatic and connectivity characteristics of the surroundings. This methodology of generative design resulted in a precisely calibrated design scheme, addressing the full spectrum of a project’s required functionalities and accommodating its adaptation towards social, economical and environmental performance criteria and contexts. The starting point for the design was the location of several centre-points and edge conditions based on the analysis of regional and local connectivity requirements. The points acted as Program Centres, locating new areas of specialised programs such as housing and offices, as well as a ‘mixing zone’ in between them. In the next stage, a range of urban massing typologies was mapped onto the site, using a detailed requirements mapping to match each plot to a corresponding typology generated by a specialised digital optimisation process. Both the catalogue of typologies as well as the site mapping can be updated to generate different outcomes. The plinth massing was generated by moving two cutting volumes (internal courtyards and street corner plazas). Urban block typologies are generated by combining different types of volumes for the four different quadrants of each plot. 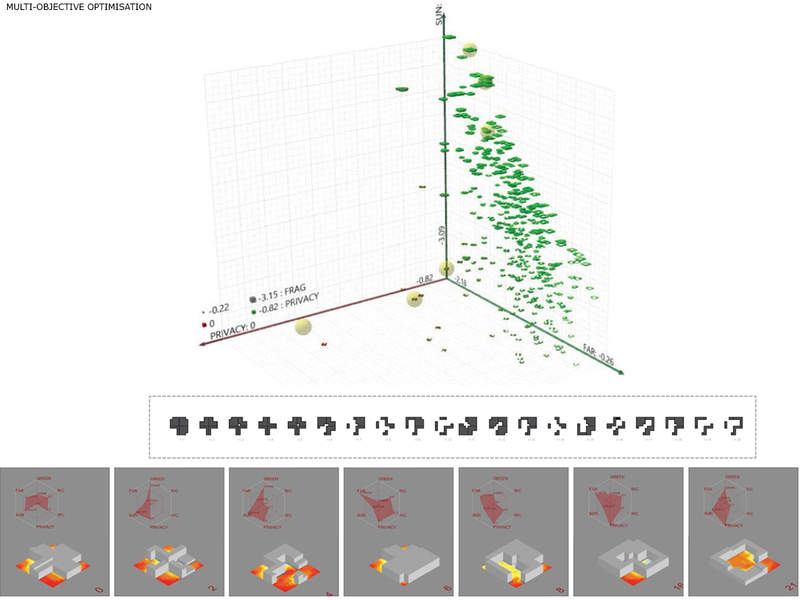 Using the Genetic Algorithm software ‘Octupus’ (a plugin for Rhino/Grasshopper), a large population of urban block typologies is generated and evaluated for their characteristics. Initially generated at random, the software will automatically select and refine the more successful typologies – depending on criteria that are defined as ‘successfull’. 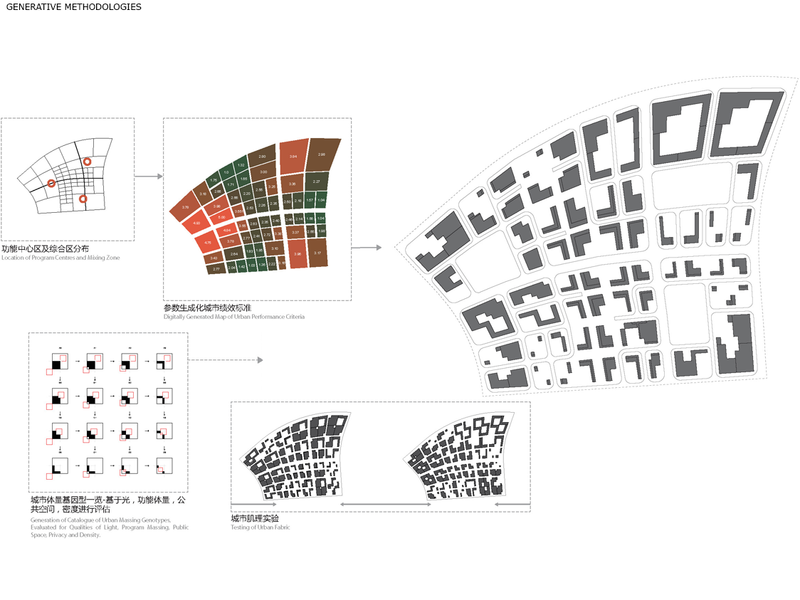 The criteria used in this project included the following: sunlight exposure in the open spaces, the total FAR of the plot, the geometry of the blocks and their capacity to accommodate larger or smaller program areas, and the accessibility of the open spaces (if the corner plaza are open from the street, the plots is considered ‘public’ or ‘extrovert’, as opposed to ‘private’ or ‘introvert’). The principle of the Genetic Algorithm is a relatively simple conceptual process. In the first step, a Population of individuals is generated at random by varying some of the properties of the geometry. The individuals are then evaluated and the top 50% of the best performing individuals are selected for further development. The selected indidividuals are recombined and used to create a new generation of individuals, using the geometric features that have been proven successful. As part of the creation of the new generation of individuals, a small amount of random mutations are added to the geometries, which could lead to possible diversity. This generation is then evaluated again as the process repeats. Using a separate Genetic Algorithm, the tower locations were varied and evaluated against the optimal configuration to maximise the sun exposure to all of the tower facades in the site. This minimised self shading and contributed to good quality living and working spaces, using passive heating in the winter season. Based on the ‘mixing zone’ mapping layer developed earlier, the FAR distribution map for the individual plots was generated. 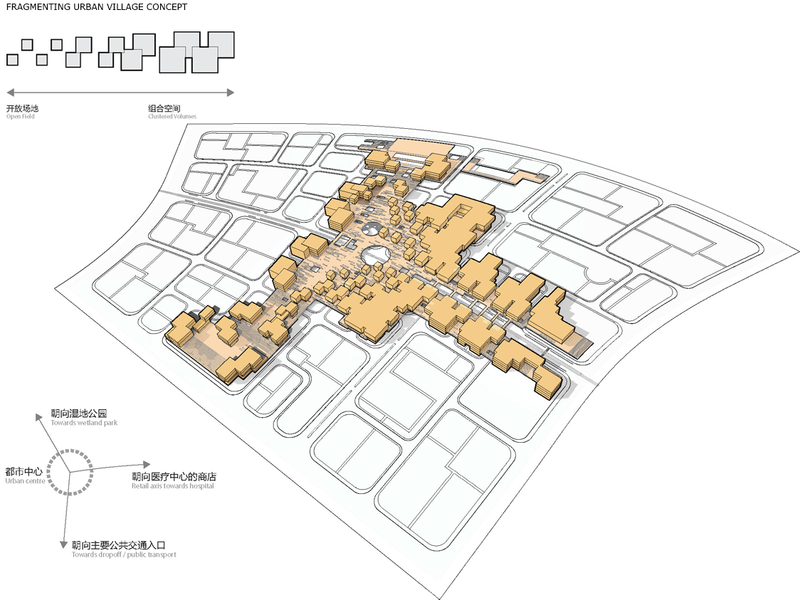 A range of building typologies was used to populate the masterplan area following criteria for proximities to views, pedestrian areas, busy roads and some top-down zoning criteria set out by the local government. A residential zone in the north-east corner was populated with elongated tower slabs for high-end apartment buildings, while the high-rise around the mixing zone attracted a number of taller compact footprint towers suitable for corporate headquarters and tenanted floors including embassies and related international agencies. 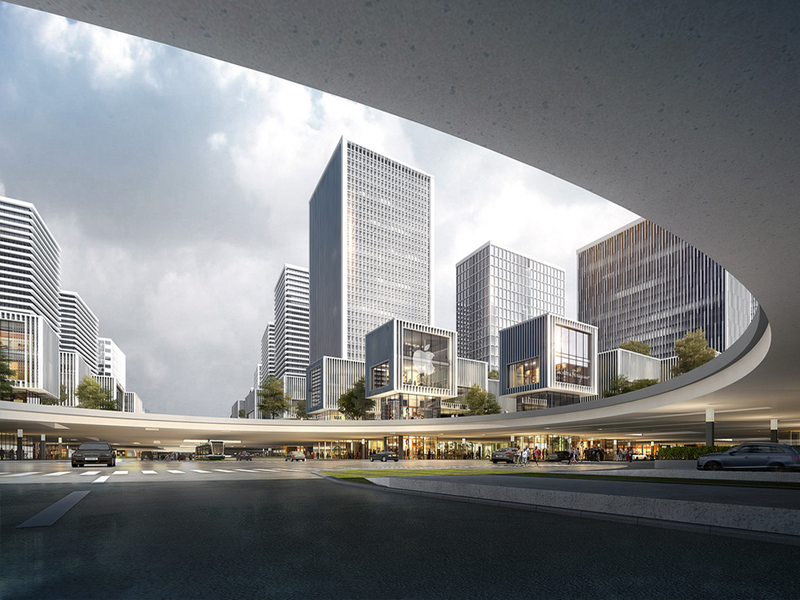 The design for the Changsha International Communication District aims to incorporate large public spaces suitable for a variety of social and commercial activities, and a raised pedestrian network that is part of the public domain – connecting to a rich and varied mixture of programs. The elevated pedestrian network occurs within the ‘mixing zone’, emphasising and intensifying the dynamic and diverse nature of this area. Following the ‘Green City’ manifesto, the urban plan maximises the use of planting, grass areas and trees to provide natural spaces for people as well as the eco-systems of the city. Public plazas at most street intersections for active and green social spaces, while three large park spaes contain shared facilities amongst lush greenery. The elevated pedestrian deck contains green elements as well as lighting strips and benches embedded in the plaza surfaces, inviting people to find places for resting, social and cultural activities amongst intimate and human scale urban spaces. The deck merges with the wetland park at the north through a gradual transition.